Air travel can make eating healthy a bit trickier but with a little thought and some planning, you can still eat well and stick to your goals. We all know airports aren’t typically the best places for eating. To my knowledge, you won’t find a Whole Foods or Trader Joe's in an airport. Once past security, you will find a lot of fast food restaurants, coffee shops and convenience stores stocked with candy bars. However, if you’re willing to plan ahead or search you can eat food that fits your needs while waiting on your flight. Here are a few tips to you help eat healthy at the airport. I keep saying “planning and preparation” because they are so crucial to success. If you know you’re flight is coming up, buy food for the airport and flight ahead of time. Before the day of your flight, go to the grocery store and pick up food items to bring with you to the airport so you can eat healthy. You’ll also save money considering the markup in price once you’re at the airport. You can bring easy, snack-type items or prepare full meals packed in a cooler with frozen ice packs (must be completely frozen). Tuck all these foods away in your carry-on or bring a small cooler as your personal item. Due to security, liquids, gels or liquid-like foods (salad dressings, dips, and purees) are a no go above a certain size but there are still plenty of foods you can bring through to the gate. Protein powder (mix it later once you get through security) *security can get extra suspicious about powders so if you’re running late, leave these behind or in your checked baggage. 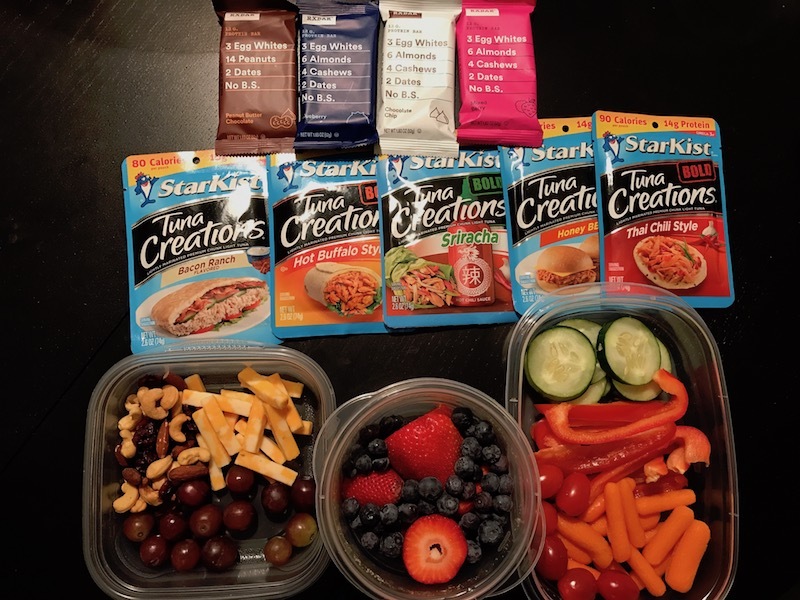 Grab a few of these items from each category before you leave for the airport and you can have yourself a nutritious, balanced meal and save yourself some money too. A little preparation can go a long way! Important note: If you bring your own food, be prepared to take it out of your carry on luggage. More than likely, TSA will want to take a closer look if things look weird or you’ve wrapped anything yourself. If you bring your own food to the terminal, get to airport a couple of hours before your flight to make sure you have enough time to get to the gate. 2. Make your food travel-friendly the night before your flight. Get some meal prep containers or use ziploc bags to hold your foods. Cut up veggies and fruits to make them smaller and more portable. Make salads ahead of time. If you need dressing, bring a lemon to squeeze and grab some salt and pepper from any food court or get a salad dressing pack from a grab-n-go stand. As you prepare your food, make sure to portion out your servings because it’ll be easier to control your food intake. This is far superior to buying something at an airport stand or fast-food place and having no clue how much or what you’re eating. Even if the food has a nutrition label, I’ve seen some grossly exaggerated numbers on those airport stand sandwiches and salads. Plus many snack foods found in convenience stores contain MULTIPLE servings, so unless you’re planning on eating an entire bag of trail mix, you’d do well to prepare and portion your own food before you get to the airport. Let’s say you just didn’t have time to prepare ahead and you’re at the airport with no food. You can still make do if you’re willing. The time you have before boarding your next flight and the terminal your gate is located largely determines where you’ll get your next airport meal. If you have a while before boarding, you probably have enough time to sit at a restaurant and order a meal. Try to find a sit-down or semi-fast food restaurant with healthier options. I usually seek out Japanese for sushi, a steakhouse or Mexican/Tex-Mex restaurants for fajitas or fish tacos. If you do a burger or pub restaurant order on the lighter side and avoid fried foods. If the sides options are fries or chips, ask for a side salad or vegetables instead. Pro-tip: Order quickly, ask for the check early, and pay right away . This will save you time and give you more time to eat if you’re shorter on time. Get a burrito bowl with grilled protein, beans, rice, veggies and salsa. I’ll get guac if I’m not watching calories during a cut simply because guac is just amazeballs. Go for a small deli or veggie wrap or small sandwich. I also go for their protein boxes. Usually has some protein, cheese, carbs, veggies and a bit of fruit. If you have very little time, your options are usually the convenience stores and grab-n-go stations by the gate. If you do these, avoid the candy, high-sugar Naked Juices and pre-made protein drinks, sugary sodas, super sweet trail mixes and granola bars. Choose things like beef jerky, plain nuts not covered in chocolate or yogurt, sunflower seeds, raw veggies and hummus dip, fresh fruit or the very small sandwiches or salads. Examples of some better options at an airport convenience store. Take your time with your food so you can fill up faster and better manage your food intake. If you need refresher on slow eating strategies, reference this article I wrote. If you’re short on time for your next flight, just bring the food on the plane rather than wolfing it down running to the gate or waiting for your turn to board. Hunger is not an emergency. You can wait until the plane takes off and you’re cruising. High altitude will dehydrate you and being dehydrated is no bueno. You’ll be zapped of energy, more likely to overeat, and if you’re about to worried about your weight or how you look, you’ll likely be heavier and bloated the next day due to water retention. Bring your own water bottle to avoid paying 5+ bucks for a half liter of bottle water. If you don't have you're own bottle, there are a ton of options for quality water bottles. I have a stainless steel Sip Bottle from Swell that fits into one of the side pockets of my backpack very nicely. Whatever you decide to bring, make sure you fill up the bottle AFTER you make it past security, otherwise you’ll just have to refill it because security will make you pour it out. Also, I know a lot of folks like to po' it up and booze a little at the airport. If you're trying to stay on-point, I would avoid that and just wait until you get to your final destination and moderate it when you get there. If you do drink alcohol, just keep it reasonable and be sure to drink an extra few ounces of water to balance out the beer, wine, or liquor. Pack your water bottle first and never fly without one! Travel can be hectic--especially if you’re traveling with multiple people or little ones. Just do your best to plan and prepare ahead of time as much as you can. If you didn’t bring food, make smarter choices when it comes to food. Choose foods that you’d normally eat at home or focus on just doing better or good enough rather than being perfect.